The Ex have defied categorization ever since they started playing in 1979. Born out of the punk explosion, when anything and everything was possible, the band have still managed to retain both curiosity and passion for their music. Using guitars, bass, drums and voice as ther starting point The Ex have continued to musically explore undiscovered areas right up to the present day: the early 1980s saw collaborations with jazz musicians and an Iraqi-Kurdish band. 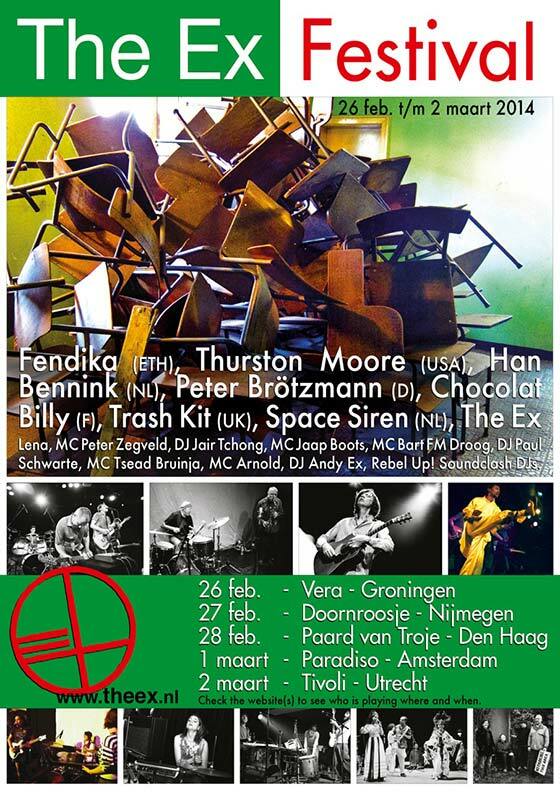 In the 90s the group found a myriad of partners from varied musical and non-musical backgrounds including Kamagurka, Tom Cora, Sonic Youth, Han Bennink, Jan Mulder, Ab Baars and Wolter Wierbos. In 2002 The Ex set up a lively musical exchange with Ethiopia, which eventually led to two CD recordings and hundreds of concerts with the legendary saxophonist Getatchew Mekuria. After 34 years, more than 25 albums and around 1800 performances the band continues to work as they did in when they began, completely independent of record companies, managers or roadies. Because of this 'do it yourself’ work ethic The Ex is still a great example for other forward-thinking bands and musicians.